On September 25, 2009 at approximately 2:37 PM a Toyota Camry driven by Brittany Dean was traveling south on US Route 15 in the left lane. As she approached the construction zone just south of the Bowmansdale exit, Dean attempted to move from the left lane into the right lane. 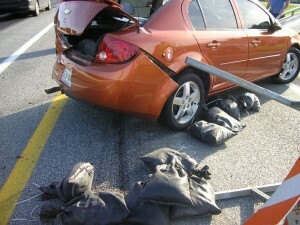 Prior to entering the right lane, Dean struck an orange construction barrel in the center of the roadway. Dean then attempted to steer back into the left lane, causing the vehicle to lose control. After two attempts at gaining control, Dean’s vehicle struck the center guide rail. The impact with the guide rail caused both the driver and passenger side air bags to deploy. Dean sustained minor injuries that did not require treatment. On September 20, 2009 at approximately 4:30 PM a Chevrolet Cobalt driven by Benjamin Holmes was traveling south on US Route 15 in the right lane. As he approached the bridge construction at the SR114 overpass, Holmes moved to the left lane which was occupied by a Ford F350 pulling a camper trailer driven by Raymond Hoffman. Holmes’ car was struck by Hoffman’s truck which caused Holmes to lose control and strike the guide rail in the center median. 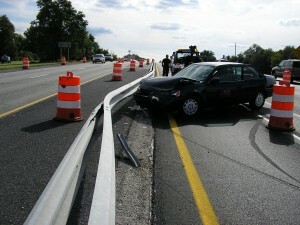 The impact with the guide rail caused driver’s side air bag deployment. Holmes corrected and veered into the construction median created by orange barriers striking a construction sign. Minor injuries were reported, but the parties declined EMS treatment. September 12 through 19 marks Child Passenger Safety Week and Upper Allen Township Police Department would like to invite all parents and caregivers to make their children safer with our help. According to the National Highway Traffic Safety Administration (NHTSA), motor vehicle crashes are the leading cause of death for children of every age from 3 to 14 years old. This year’s child passenger safety week theme is “Pennsylvania’s Life-Saving Team.” This team includes law enforcement agencies (including Upper Allen Township PD), medical professionals, community organizations, car seat loan programs and fitting stations. This “Team” is thankfully making a difference and their success can be seen in the reduced number of fatalities involving children. According to NHTSA, over the period of 1975 to 2007, 8,709 lives were saved by child restraints. Our department has a number of Child Passenger Safety Technicians who will be more than happy to educate you and assist you in installing your child safety seat. Call us today to set up an appointment- let’s make buckling up a life-long and life-saving habit! Police are investigating a burglary that occurred in the 700 block of Cumberland Pointe Circle. 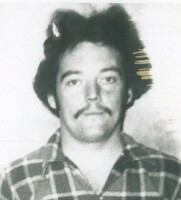 Between 4:00 pm on August 25, 2009 and 9:00 am on August 31, 2009 a vacant residence was forcibly entered through the front door. Once inside the suspects caused damage to the flooring and several interior walls. Anyone with information is asked to contact the Upper Allen Township Police Department at (717) 238-9676 or through our anonymous tip line at (717) 591-3790. On September 1, 2009 at approximately 4:43 PM, Upper Allen Township police officers were dispatched to the intersection of Gettysburg Pike and Fisher Road for a two car crash. 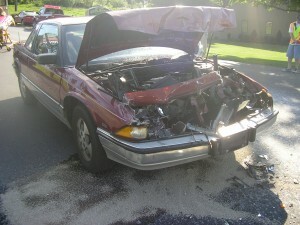 Stoner was waiting on Gettysburg Pike to make a left turn onto Fisher Road when she was rear ended by Oyster. Oyster and Stoner were transported to Holy Spirit Hospital and Harrisburg Hospital respectively by West Shore EMS. The Upper Allen Township Police Department was assisted on scene by the Upper Allen Township Fire Department and Fire Police.